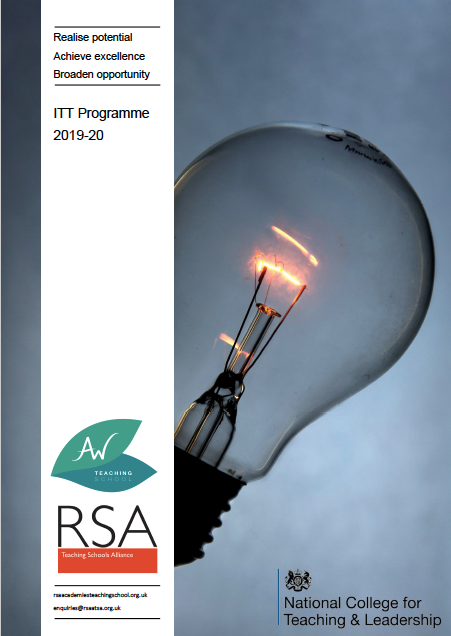 The School Direct programmes give RSA schools the opportunity to further enhance our teacher training provision. We have developed new, exciting and innovative programmes, working with highly regarded local Higher Education organisations. School Direct is a school-based approach to teacher training, which enables you to experience the life of a ‘real’ teacher, as you will be based in school from the very start of your training. We are working in partnership with Birmingham City University (BCU), and on successful completion of the course, you will be awarded a postgraduate certificate in education (PGCE with QTS) with the opportunity to obtain additional Masters’ credits. We will be offering 2 training routes – School Direct Training route and School Direct (Salaried) route, which will enable all of our trainees to experience a school-led training programme. These routes have been designed to ensure all trainees receive a rich experience of hands on training, covering all aspects of school life from the outset. In this way, we can make sure they are receiving the most up to date training and support, which will allow us to grow our own teachers for the future. There are two types of programmes available, both programmes run for one academic year and are full-time. Salaries and bursaries are available to support you and your training – Further information is available on the ‘Eligibility and Funding’ section on the Department for Education website. Degree of a UK Higher Education Institution or equivalent qualification. whilst a 2:1 classification is preferable each application will be considered on an individual basis. Secondary candidates should note that at least 50% of their subject knowledge at degree level should match the subject/s to be taught. An academic transcript may be required. For secondary candidates; a standard equivalent to a grade ‘C’ in the GCSE examinations in English language and Mathematics. All entrants have achieved a standard equivalent to a grade ‘C’ in English language and literature, mathematics and science. All entrants hold a degree from a United Kingdom Higher Education Institution, (including overseas qualifications, professional or vocational qualifications and qualifications no longer available held by mature applicants). All entrants hold suitable qualifications in their chosen subject area. All candidates are required to apply via UCAS. Applicants will receive notification of successful, or unsuccessful application, within 40 days of submission. All entrants have successfully completed professional skills tests prior to entry. (Feb 18 update, changes to the skills test include: The removal of a lock-out period that previously prevented aspiring teachers from re-taking tests for two years. No limit on the number of tests, and the first three tests are free of charge to all candidates; and refunds for anyone who has already paid for tests in this year’s recruitment cycle – on or since 24 October 2017). All entrants have provided suitable references, and have been subject to the Disclosure and Barring Service (DBS). Applicants/trainees with disabilities are under no obligation to disclose their disabilities. Must be able to demonstrate an ability to communicate clearly and grammatically in spoken and written Standard English. For applicants that have studied outside the United Kingdom, they must check their qualifications with NARIC (National Academic Recognition Information Centre) before making an application, to confirm that their qualifications are of an equivalent level to UK GCSEs A Levels and undergraduate degrees.